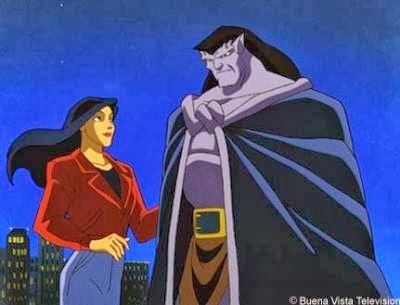 Disney's Gargoyles aired from 1994 - 1996, and I have no idea how I missed it. I was actively watching cartoons and specifically watching them on Disney, but I don't remember hearing about Gargoyles or seeing commercials. The animated series about a clan of gargoyles who come to life at night didn't get on my radar until many years later. Friends have said nothing but positive things about the cartoon, and I finally devoured the first season. To say I'm impressed and delighted is an understatement. I had reservations since the cartoon is twenty years old, but that was dumb. Gargoyles, created by Greg Weisman, holds up surprisingly well. The basics: a clan of gargoyles who are "stone by day, warriors by night" are the last of their kind and go from living in 994 to 1994. I don't want to give away more details than that. I wish I would have watched it sooner, but better late than never, right?. If you haven't watched the series yet, it's definitely one worth clearing your schedule to view as soon as you can. Need reasons? I have five. 1. Characters - The first season provides a look at complex characters who go through changes big and small. Development is on a level I wouldn't expect from a '90s cartoon, and I've only seen a handful of modern cartoons that match it. We watch the leader of the gargoyles clan, Goliath, struggle with jumping a millennium into the future, wrestle with guilt about not being there when his clan was wiped out, and oh boy, does he have trust issues. And that's just one character! Almost everyone has an arc and is in a different place than where they started by the end of season one. No member of the primary cast is superficial. From the vindictive Demona to the curious Lexington to the open-minded Elisa - there's a lot to absorb and it's a wonderful and surprising ride. 2. World-building - One of the shining aspects of Gargoyles is the world-building and exploration of myth. The universe is similar to ours, but fantasy elements are carefully woven in so that you can easily believe gargoyles come alive at night - you start looking at the sculptures differently. The series captures some real world issues like prejudice and how humans act react with fear to things they don't understand and blends all of it together with magic and myth. It takes a fine touch to make gargoyles gliding around New York City believable and fascinating instead of silly. 3. Art - The art! Gargoyles' style screams Gothic, and even if darker tones in cartoons have become more common now, a heavy palette wasn't the norm back then. Though the colors weren't bright and in your face, they were still rich. They had to be for a series that mostly takes place at night. The deep blues, purples, and reds are vivid and make New York look beautiful. And, we really get to see the city through the eyes of Goliath and his clan. It seems like the people involved were careful to show us different angles and the gargoyle's-eye-view. Seeing the world in this way adds to the depth of the series. By the way, why isn't there an Art of Gargoyles book? Give me permission, Disney, and I'll write it for almost nothing. 4. Voice cast - You can play a fun game called "name the Star Trek: The Next Generation" cast member while you watch Gargoyles. You'll hear Jonathan Frakes and Marina Sirtis in two of the main roles, and several others pop up over the duration of the series. In addition to them, the cast features the talents of Keith David, Frank Welker, Edward Asner, Jeff Bennett, Salli Richardson, Thom Adcox-Hernandez, and Bill Fagerbakke. The list goes on to read like a who's who of voice acting. It's impressive. And the sound effect used when any of the gargoyles are climbing up a building? It just makes me happy. Convinced yet? It just so happens you can watch the first season for free on YouTube. Let me know how you feel about Gargoyles - whether you just watched it for the first time or you've viewed it 50 times. I loved this when I first saw this a kid. I remember the first season well but the later seasons not so much, i wish netflix released the entire series and not just the first season. I mistyped - it's actually on YouTube. Still just the first season though. In fact, I think volume two of season two only came out on DVD in the past six months. I've loved this series since I watched it in the 90s. The VHS actually came with a game! You would roll the dice and play with the amazing music in the background, but periodically the game would be interrupted by the characters. Obviously, some characters provided bonuses and others negatives. I have very fond memories of this show. I completely forgot about this show! Also course will certainly reveal on display. ParentPay Merely enter the postal code of your present area as well as.